Now that I finished this recipe, let me say that as I began I was not too enthusiastic about it. 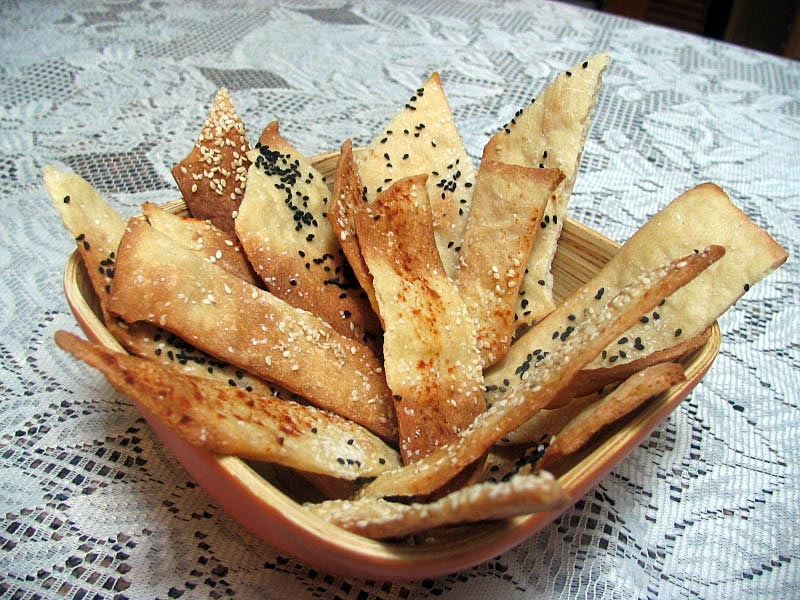 I tried to make Ak-Mak-style crackers before, using an internet recipe, and I was unhappy. Not only was it a lot of work, but they had nothing to do with my favorite cracker. But, a challenge is challenge, so I took a deep breath, grabbed the flour and went for it! Thanks to the advice of those who are ahead of me, I knew that rolling a thin dough was important, or else the potential crackers would become pita bread. Not that there’s anything wrong with pita, but…. 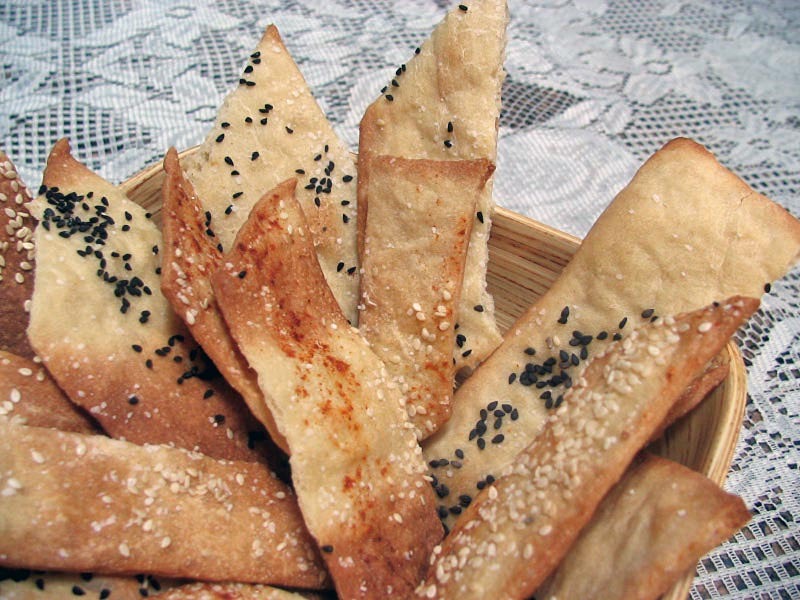 pita is not a cracker. Here you see the beginning of the process, a simple dough (53% hydration) made with flour, honey, oil, salt and instant yeast. Again, I did not bother kneading it to death. After incorporating the ingredients into a ball, I allowed it to sit for 15 minutes, then folded it a few times until it got smooth. From that point, I followed the recipe as written. In 90 minutes, it was ready to roll out. 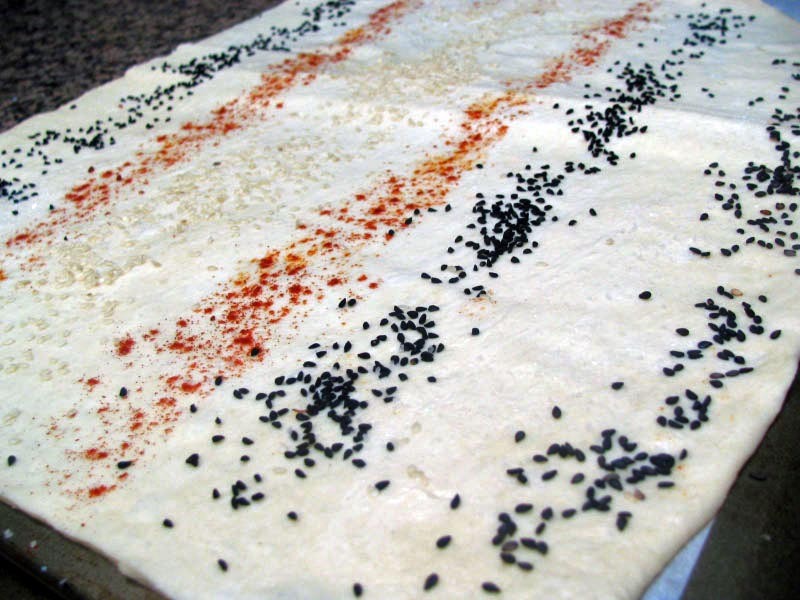 Make sure that you roll it as thinly as possible without tearing the dough. I found it very forgiving, with no problems to roll out, although it was a bit tricky to lift into the baking sheet. To decorate the dough I used nigella seeds (which I bought here), black sesame seeds, smoked paprika, and coarse salt. Into the oven it went… As you bake it, keep an eye on it, because if your rolling is uneven, some parts might darken faster than others. It happened to me, but I broke the darker parts away and allowed the rest of the sheet to stay in the oven longer. This approach worked quite well. As they cooled down, I decided to try one. Then another. Then another. My beloved husband was not expected back home for at least 3 more hours, and the deepest proof of my love for him was this bowl with many crackers still inside. I made these last year for Daring Bakers and they are indeed great! I found it worked well to roll it our on parchment and just keep it there for baking. Those smoked paprika ones are really calling my name. When I make these next time (and I definitely will be making them again very soon!) I’ll roll on parchment, and roll half the portion at a time, just to get them as thin as possible. Your crackers are a work of art. So pretty, what a shame to eat them (Not!!) I am about to make mine tonight. Great idea to use s,moked paprika. I may just do that too! Oh, those look great. I agree about the dough – it was so easy to roll out and hold it’s shape, not spring back.